An Inconvenient Sequel: Truth to Power reminds us what can happen when regular citizens take a stand. The film showcases our Climate Reality Leadership Corps trainings, where people from all walks of life come to work with Vice President Gore and other experts, learning key climate science and gaining the skills to lead their communities in the fight for climate solutions. If you’re ready to make a difference for our planet – if you’re ready to fight like your world depends on it - like Vice President Gore and the 12,000-plus Climate Reality Leaders in over 135 countries, we’ll show you how. READY TO MAKE A DIFFERENCE FOR THE FUTURE OF OUR PLANET? Sign up to receive updates from Vice President Gore and other members of The Climate Reality Project. If you’re ready to learn more about what’s next for the climate movement – and how you can get involved – our I Am Still In action kit will give you the tools to drive change at a critical time. Your support is vital. Help us promote the practical solutions to the climate crisis. Learn about climate change and its solutions, straight from former Vice President Al Gore and renowned climate scientists at our next Climate Reality Leadership Corps training. 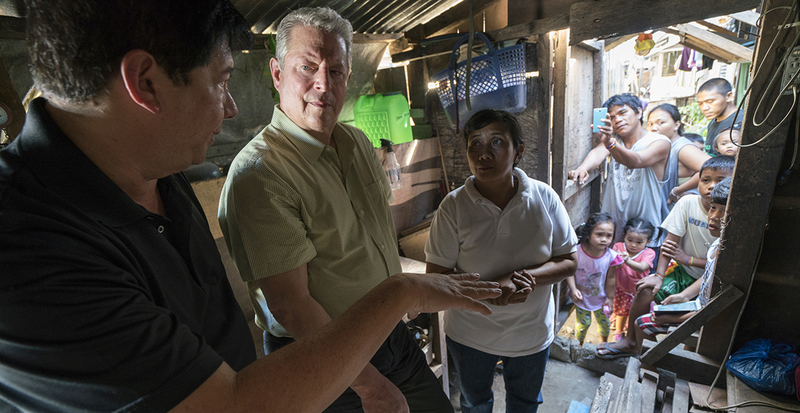 Al Gore, Founder and Chairman of The Climate Reality Project, with former Mayor of Tacloban City Alfred Romualdez and Typhoon Haiyan survivor Demi Raya, in the Raya family home; Tacloban City, Philippines, March 12, 2016 in An Inconvenient Sequel: Truth To Power from Paramount Pictures and Participant Media. Photo Credit: Jensen Walker © 2017 Paramount Pictures. All Rights Reserved. 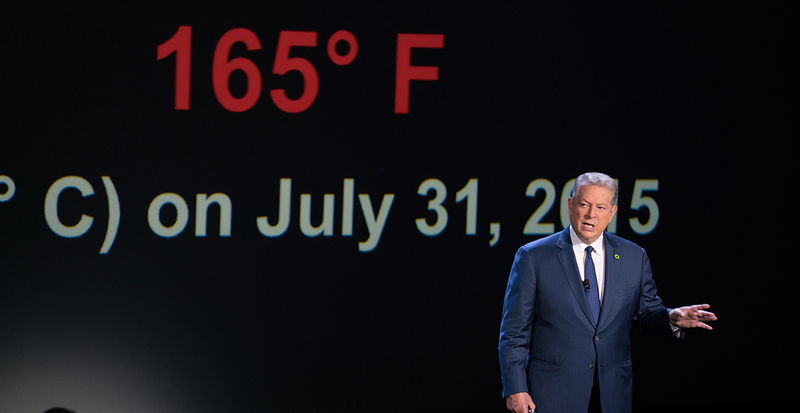 Al Gore giving his updated presentation at the Climate Reality Leadership Corps Training in Houston, TX in An Inconvenient Sequel: Truth To Power from Paramount Pictures and Participant Media. Photo Credit: Jensen Walker © 2017 Paramount Pictures. All Rights Reserved. 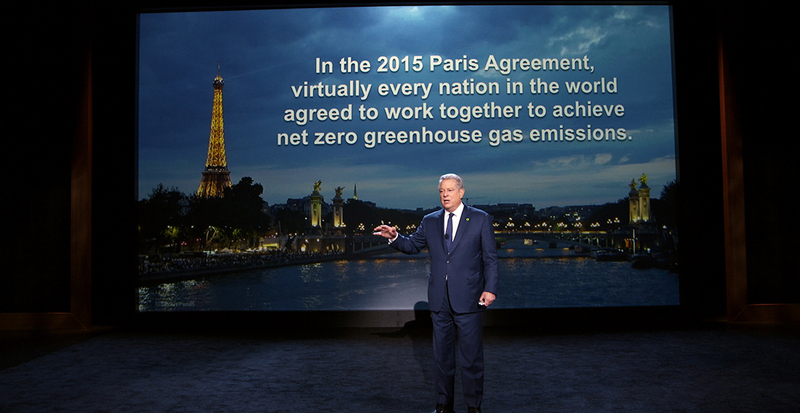 Al Gore in Paris, France for 24 Hours of Reality in An Inconvenient Sequel: Truth to Power from PARAMOUNT PICTURES and PARTICIPANT MEDIA. Photo Credit: Jensen Walker © 2017 Paramount Pictures. All Rights Reserved. 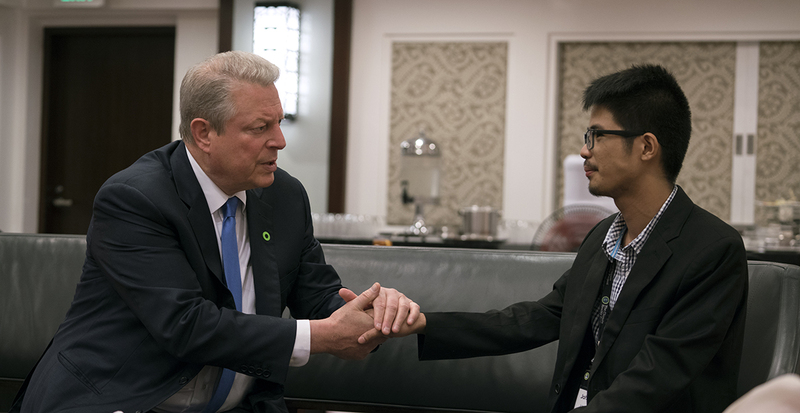 Al Gore with John Leonard Chan, trained Climate Reality Leader in the Philippines and survivor of Typhoon Haiyan in An Inconvenient Sequel: Truth to Power from PARAMOUNT PICTURES and PARTICIPANT MEDIA. Photo Credit: Jensen Walker © 2017 Paramount Pictures. All Rights Reserved. Al Gore giving his updated presentation at the Climate Reality Leadership Corps Training in Houston, TX in An Inconvenient Sequel: Truth To Power from Paramount Pictures and Participant Media. Photo Credit: Paramount Pictures and Participant Media © 2017 Paramount Pictures. All Rights Reserved. 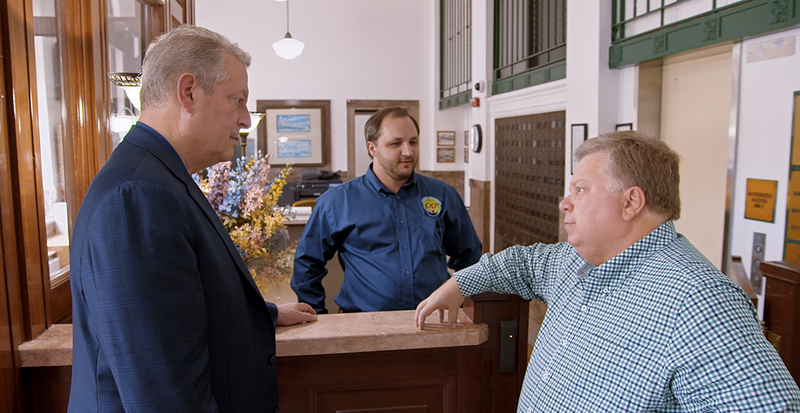 Al Gore and Mayor Dale Ross of Georgetown, TX in An Inconvenient Sequel: Truth To Power from Paramount Pictures and Participant Media. Photo Credit: Paramount Pictures and Participant Media © 2017 Paramount Pictures. All Rights Reserved. Q: Why make a sequel? Back in 2006, An Inconvenient Truth sounded the alarm on the climate crisis, starting a global conversation and inspiring a new kind of climate movement to rise up and confront this challenge. A decade on, the movement has made incredible progress and we’ve won incredible victories like the Paris Agreement. But our work is far from done and the threat to our planet is even greater and more urgent than ever. The good news is that today, clean energy solutions are more affordable and practical than they’ve ever been and we have the tools we need to solve the crisis. And the world needs to know. It’s time to sound the alarm again. It’s time to get to work and unite the planet in working together to solve the climate crisis. An Inconvenient Sequel: Truth to Power rings the alarm loud and clear, calling on all of us to fight like our world depends on it. Q: How is this film different from the original? An Inconvenient Truth was a wake-up call alerting the global community to the reality of the climate crisis, bringing unprecedented awareness of this existential threat to our public consciousness. An Inconvenient Sequel: Truth to Power documents how the crisis has become more severe, but also highlights the many clean energy solutions at hand. We don’t have time to wait – but solutions are here and clean energy is replacing dirty fossil fuels in more and more places around the world. We have so many reasons for hope. Q: What’s the connection between The Climate Reality Project and Truth to Power? After An Inconvenient Truth, former Vice President Al Gore created The Climate Reality Project to train the next generation of organizers and activists to spread the word about the climate crisis and catalyze solutions around the world. 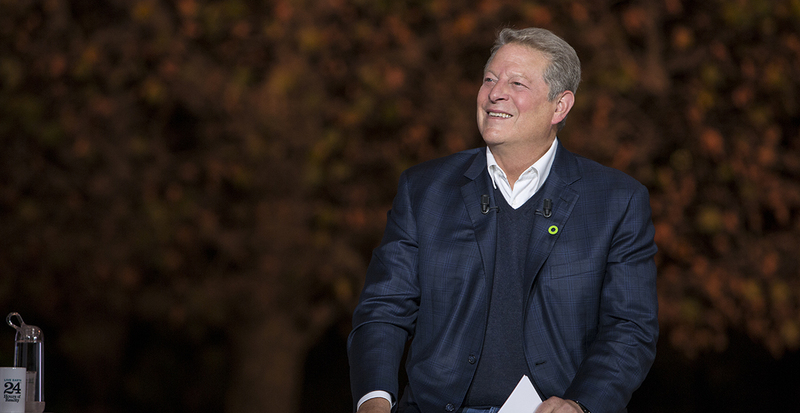 The film prominently features Climate Reality Leadership Corps trainings as part of Vice President Gore’s work to build a global movement to solve the crisis. Climate Reality Leaders are trained to share the urgency of the crisis and the many solutions at hand to their communities. They give versions of Vice President Gore’s slideshow all around the world, and drive change in powerful ways, like stopping the construction of a coal export terminal or addressing the impacts of the crisis on poor rural communities. Q: What role does The Climate Reality Project play in the story of Truth to Power? A big one. 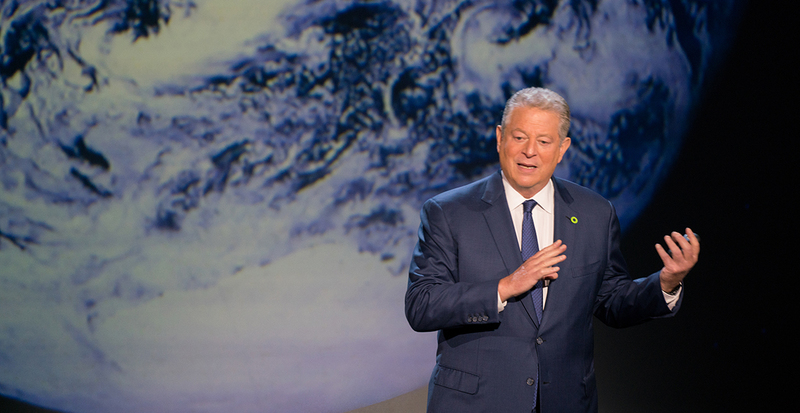 Watch An Inconvenient Sequel: Truth to Power and you’ll see Vice President Gore building a global movement of citizens fighting for a sustainable future. Those Climate Reality Leaders you see him training? That’s us. Those supremely smart and attractive women and men around him at the Stanford speaking event? Us too. There’s a place for you in this movement and a way you can make a real difference by joining our work. Sign up for our activist email list and we’ll show you ways to speak truth to power and make a greater impact than you thought possible. As we say: You want to change the world. We’ll show you how. Q: What do you want audiences to come away with? Two things. The first is hope. We’re not talking about Pollyanna fantasies. We’re talking about a grounded belief that we can and will solve the crisis. Because – with the costs of clean energy decreasing all the time and people rising up around the world to demand their leaders take action – we can. The second is the knowledge that we can all make a real difference in the fight for climate solutions, no matter how old we are, what we do, or where we live. Q: What can I do to help the movement? First, use your voice. Start by downloading the Truth in 10 presentation to get the latest on climate science and solutions in an easy-to-follow format. Then, share the truth and talk to your friends and family members about the crisis and how we’ll solve it by shifting to clean, renewable energy sources like wind and solar. The more people who understand both how urgent the crisis and how affordable and practical the solutions are, the more momentum we build for the transition to a clean energy economy. And for your friends and family, there’s no better messenger than you. Don’t stop there. Speak up and demand that your elected officials at every level – from town or city council members to representatives and senators – take action to cut emissions and embrace clean energy solutions every way they can. Second, use your everyday choices. Choose to sign up for Climate Reality’s email activist list and get involved with our on-the-ground efforts to accelerate the shift to a clean energy economy. And when you’re ready to take the next step, choose to apply to become a Climate Reality Leader. Q: What about recycling and using energy efficient light bulbs? I thought I was doing enough. Q: How do I learn more about the climate crisis? There are many great resources out there, but an easy place to start is with Climate Reality’s Climate Crisis 101 resource. Q: Can I get a copy of Vice President Gore’s presentation in Truth to Power? Yes! 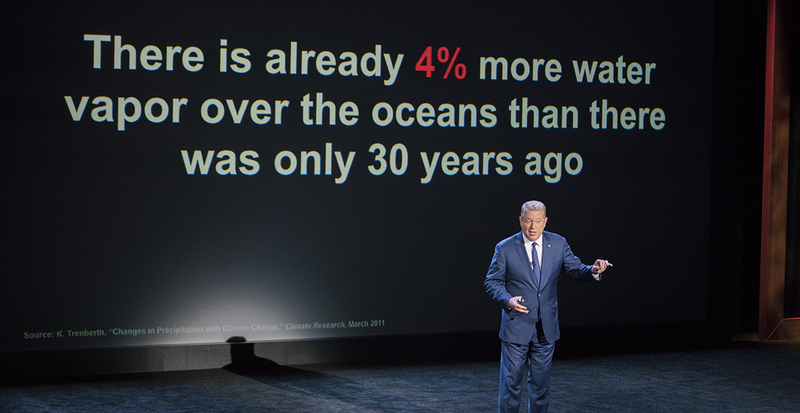 Vice President Gore has created a 10-minute version of his presentation called Truth in 10, available at inconvenientsequel.com. You can use it to share the truth about the climate crisis with friends and family members. Download it here. Q: The push to reach the Paris Agreement is a central part of Truth to Power. What happens now that President Trump has announced that the US will withdraw? The president’s decision to withdraw the US from the agreement is a disappointment for sure. But it’s not the end of the world. US withdrawal takes the federal government temporarily out of the fight for a sustainable future. But it does nothing to change the market forces stronger than any politician making clean energy alternatives cheaper every year. Renewables like wind and solar are now cost-competitive – and sometimes even cheaper – than fossil fuels in more and more regions around the world and this trend is only growing. The president’s decision also does nothing to change the seven out of 10 Americans who support the agreement and want the country to confront the crisis. Just witness the hundreds of thousands of Americans who’ve stood up to say “I Am Still In” the agreement. Or the over 220 cities and communities, nine states, and 1,650 companies and investors who’ve come together to make good on US climate commitments – without the White House. Or the 19 other leaders of the world’s biggest economies who reaffirmed their commitment to the Paris Agreement at the group’s July 2017 meeting. What this means is that the support for bold action is there, both in the US and abroad. We have the power in our hands to make a sustainable future a reality. Now we have to act. We have to use our voices to make climate an issue no politician can ignore. We have to choose clean energy alternatives to dirty fossil fuels and work together in our communities and with activists around the world to cut greenhouse gas emissions at every turn. This is how we’ll win. Q: Doesn’t the process of making a film like Truth to Power have a major carbon footprint? We all inevitably leave our footprint on the Earth. The question is how we minimize and mitigate it – and today, there are many ways for individuals and businesses of all sizes to significantly reduce or completely offset their footprints. The producers of An Inconvenient Sequel: Truth to Power worked with a third-party to offset all emissions associated with the film and ensure it was a carbon-neutral project. Q: What does “Truth to Power” mean? In recent decades, movements from marriage equality to civil rights to ending apartheid have fought to make our world a more fair, just, and wonderful place. And while each movement has had its own specific aims and methods, each has united countless citizens of all creeds, backgrounds, and walks of life in speaking the truth of their cause to the interests of the rich and powerful in their way. An Inconvenient Sequel: Truth to Power connects the fight for a sustainable future to this proud tradition of great social movements. The film gives voice to the truths of the climate movement: our climate is changing, largely because of human activity, and we can solve the crisis with a shift to clean energy. By speaking up for truth together, we can and will solve the climate crisis for ourselves and future generations. Q: Who are all those people in the audience listening to Vice President Gore? Climate Reality Leaders! These are regular citizens from all walks of life concerned about the climate crisis and committed to taking action to solve it. Leaders attend a multi-day training where they attend sessions with Vice President Gore and a host of other field-leading experts, gaining the organizing and communications skills to mobilize their communities to act. To find out how you can become a Climate Reality Leader, visit our training page. Q: What’s that song in An Inconvenient Sequel: Truth to Power and how do I find it? The song is “Truth to Power” by OneRepublic. Q: What happens with the proceeds from An Inconvenient Sequel: Truth to Power? Does the film personally benefit former Vice President Al Gore? There was a big team involved in making Truth to Power, with many people, companies, and organizations pitching in to help with the film. Vice President Gore’s own personal share of proceeds will go to support the exact same work documented in the film: equipping and training citizens to become world-changing activists through the Climate Reality Leadership Corps and other Climate Reality programs. Or, to put it another way, when you see Truth to Power, you’re helping support the movement and fight for climate solutions it captures. That’s energy efficiency. Vice President Gore’s own personal share of proceeds will go to support the exact same work documented in the film: equipping and training citizens to become world-changing activists through the Climate Reality Leadership Corps and other Climate Reality programs. To put it another way, when you see An Inconvenient Sequel: Truth to Power, you’re helping support the fight for climate solutions. Q: What is Vice President Gore’s favorite kind of food? And does he have a favorite color? You can never go wrong with Tex-Mex. Seriously. And blue. Like the oceans.